Have you noticed that tardiness is on the rise? People are chronically late for work; for their child’s teacher conference or athletic contest; or even for parties and celebrations. As the old saying goes, “they will even be late for their own funeral.” Yet, punctuality is one of the key ways that we can positively brand ourselves. Today we will explore why it is so important to be on time for all of your scheduled events. Whatever your appointment may be—a phone call, a business meeting, or a dinner engagement—you should always strive to be on time. · Demonstrates that you are diligent and dependable. · Indicates that you honor your commitments and you can be trusted. · Shows that you have respect for other people and that you care as much about their time as your own. · Sets a good example for your children and others who look up to you. · Builds self-confidence and success. One of the common attributes of all successful people is that they view their time as a precious resource. When you are late for appointments with people who value their time, you will have wasted one of their most valuable assets and there is a good chance they will view you as rude, irresponsible and disrespectful. Is this how you want to brand yourself? Not only should you make every effort to be on time for business-related appointments, but you should also do your utmost to be on time for personal commitments. Valuing your friend’s time and earning their respect is an important part of your individual reputation. Let’s now look at two specific business scenarios where punctuality is critical. 3. To make sure you are prepared for the appointment. Always arrive early so you will have a few minutes to relax, think about your agenda, and get organized. If I am meeting with some prospective clients at a restaurant, I select a table out of the way. Being early gives me the opportunity to determine the best location for the meeting and ensure that the clients are not distracted. 4. 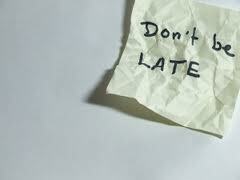 To avoid making up an excuse for being late. I don’t know about you, but I hate listening to excuses and even worse, I hate making excuses. When I was a realtor, I would arrive for my appointments five minutes early to gather my presentation materials and review any notes I had taken. Then at the exact time of the appointment I would ring the bell. This was an easy way to make a great first impression. When you schedule phone calls, always be clear about who’s responsible for initiating the call. When you don’t know who is initiating the call, then accept the responsibility and make the call at the scheduled time. This puts you in control. If you are the person responsible for initiating the call, what kind of impression will you make? Will it be positive, neutral or negative? If you want to really gain the edge in life, take advantage of all opportunities to make a positive impression on others. · Negative Impression—If you call more than five minutes early or more than five minutes late, you run the risk of making a negative impression. · Neutral Impression—If you call one or two minutes early or one or two minutes late you will likely not make any impression because it’s what most people do. · Positive Impression—When you call at the exact time of your call, you have the opportunity to make a positive impression. I have had hundreds of people tell to me, “Wow, you are right on time!” That comment tells me that I made an impact! Circumstances do arise and it won’t always be possible to be on time. If you are going to be late for an appointment, call as soon as you know you are going to be late. This allows others to plan their schedules accordingly. Cell phones, PDA’s and other technology make this an easy thing to do. When you are on time you enhance your brand. When you are late, you devalue your brand. Being on time is a choice. Let me encourage you to take pride in being a person who is always on time and prepared for your appointments. Remember, there is no downside in showing up early, but there is significant downside to showing up late. Is being on time a challenge for you? I encourage you to share your experiences in the comment section below. You can be respected, as someone who is always on time, if being on time is important to you. About the Author: Todd Smith is a successful entrepreneur of 30 years and founder of Little Things Matter. I am so tempted to respond this way to every Person A who has been notoriously late to a meeting or rendez-vous with me and arrives with this excuse. They may be my friends, my peers, my family, my colleagues, my acquaintances, my guests, or perfect strangers (well not perfect if I am meeting them but anyway), it matters little because being late is a serious habit to break. Am I the only one who feels this way about punctuality? Has our culture written off the habit of being on time as insignificant and inconsequential? Being late does not make you an important person or a special person. You may be both but not by being late. Being late once or twice in your life may be unavoidable. Being late consistently makes you unreliable. Being late means you do not respect the other person’s time. Period. Being late makes you a rude person because you lack consideration and respect for the other person and for the commitment you made to both of you. Your reasons for being late simply insult the other person’s intelligence. To be cautiously transparent, I state the obvious: Emergencies are exempt from the list above. Emergency, however, is defined as an unavoidable and uncontrollable situation which puts you in a position to not comply with your plans. You spilling coffee (or any beverage) on yourself on your way out the door. Your children making you late. For whatever reason. You have an argument with your spouse, your partner, your neighbor and then you are late. Your dog or cat or four-legged friend does something to make you late. Anything! You answer an unexpected call which runs over and makes you late. You lose track of time and are thereby late. You forget altogether about the appointment and are embarrassingly late. You are “stuck” in traffic which makes the route longer than without it. You arrive late. The last one as you know from the opening lines is my pet peeve. Calculating the distance between two points takes simple planning. If you have never traveled that route and are not familiar with traffic patterns, give yourself at least 15 extra minutes on top of what Google maps or your GPS dictates. Traffic is not a new phenomena in our life. It can be managed extremely well with planning. Traffic does not control you, excuse you, make you late or hold you back. You do. Be smart, be responsible, and plan around it! Your punctual train is delayed because of unforeseen circumstances. You have an accident while in transit. You become ill or unable to go the meeting – in which case you will be a no-show not just late. Someone you care for becomes ill and needs your help. May none of these real emergencies ever show up in your life and may you not find yourself chasing the clock every day from too many commitments, too much activity and too many promises. May you embrace instead a much better alternative: punctuality in all things. 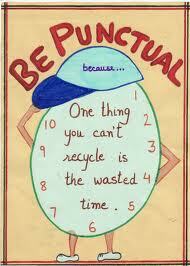 Why to be Punctual in Life? Welcoming punctuality is more than just an admirable trait; it introduces you to a brave new world that you will love! Why on earth is it important to be punctual in life anyway if there are far too many Person A types around. Because it is the right thing to do – but I shall give you more reasons too. The best motivator I can give you is that if you are a conscientious Person A, being late adds unnecessary stress to your life and breaking the habit removes it. As we know, stress can be quite the little big giant of trouble! You show respect for the Person B in your life. You show that you respect yourself enough to keep your word. You prove that you can be trusted. You are taken seriously and on your word. You open doors to opportunities without noticing it for all the above reasons. You eliminate stress from your life by removing guilt and anxiety for being late. What to do When Someone is Late? You have choices. The most popular choice is that of never mentioning it, being flexible with people’s schedule, and a myriad of other reasons to convince yourself to forget about it. Or (can you tell this is my recommendation?) you could bring it up gently once and then drop it and in the future, know that you have a choice as well as they do. You cannot change any one except yourself but a kind reminder in a gentle tone will get the message across. If you are on the receiving side of this, I would encourage you to see it from the other person’s point of view. Your time is just as valuable as theirs, regardless of your life circumstance. Be polite, be sincere, be kind but be honest and have these tougher conversations for more rewarding relationships in the future. We make our choices in a free world about lifestyle, commitments, priorities, and family. If we are responsible individuals, we will only take on as much as we can handle and handle that which we take on very well. If we are reliable individuals, we will meet our commitments to others or break the commitment professionally if we cannot make it. If we are savvy individuals, we will prioritize our activities. And if we are smart individuals, we will plan ahead, show up early and set an example to follow. One of my favorite lines from an all-time outstanding movie, “The Birdcage“, is when Agador, the “chef” announces that dinner is served as it is 8 o’clock, to which Amand, (beloved Mr. Robin Williams in one of his best roles) responds: “8 o’clock – that means 8:15, 8:30, quarter to 9” to which Agador scratches his head as he heads back to the kitchen. Amand in all his glory of a character is wrong in this instance! 8 o’clock means 8 o’clock to people unless appended with a clause, such as “I don’t really mean 8 sharp.“, “You realize I am going to be at least 10 minutes late. Right?” or “It’s 8ish we are meeting, give or take a few minutes.” Otherwise, 8 o’clock it is, baby. Be there or be square! Being late is not in your DNA. It is not a characteristic trait. It is just a good habit and like all habits, it can be broken or preserved. It is a matter of personal choice and priority. Make the right one every time!